Snapshot: The Qnap TurboNAS TS-231 NAS system has 2 hard drive bays and can stream using Chromecast, Apple AirPlay and Plex. How fast does it write and read files? Has 2 gigabit ethernet ports for fibre-fast speeds. Can stream using Chromecast, Apple AirPlay and Plex. Has a one-touch backup button. Doesn't come with a hard drive installed. Performance – assesses the write and read speeds while transferring a large set of data and a small set of data to and from each NAS system. We time the transfer while recording the speeds to measure the drive’s performance. Ease of use – we compare the ease of use of each NAS system, assess the supplied software, setup time and complexity, how easy the interface is to use and the ease of completing common tasks, such as transferring files or backing up a device to the NAS. Our ease of use test includes an assessment of the cloud access. We look at how easy it is to access the “personal cloud” these drives become when connected to home WiFi. 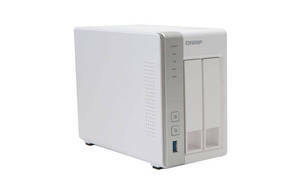 As a NAS system is designed to run constantly, so you can always access your files, we also measure energy consumption. This gives you an idea how much a system will cost you in the long run. We calculate the annual cost based on average use being 8 hours’ active use and 16 hours’ standby per day with electricity costing 25¢ per kilowatt per hour. "sold tons of these and set them up"
10 Mar 2018, Iain F.
easy to setup, local user accounts dont need to setup cloud accounts, fast, good support from local distributor. Good for protection like crytolocker \ ransomware the network paths are easily network securable, put the login details into backup software and not into computer. support desk overseas is hard to deal with but they will support the product unlike netgear.